Love hearing ghost stories? Maybe it’s time you had some of your own to tell. There are believers, there are skeptics, and there are those who just need a little more proof. If you fall into the third category, why wait for someone else to convince you that ghosts really do exist? Ghostbusting isn’t just for Bill Murray and Dan Akroyd. This is a real profession which many investigators take very seriously. One of them is Loyd Auerbach, parapsychologist and Director of the Office of Paranormal Investigations. Loyd took some time to chat with Matador’s Juli Huang to dispel some common misconceptions about ghost hunting, so before you go off on your own, make sure you read her piece Ghostbusting 101: 6 Myths Debunked by Loyd Auerbach and also Loyd’s website Mindreader.com. To help you in your quest to seek the truth, I’ve gathered up five haunted locations in the U.S. that you can visit. So, turn the lights off, light a few candles, and read on. Legend: Over 70 years ago, a young woman met and fell in love with a pianist who played at the bar which is now the Moss Beach Distillery. Although she was married with a young child, she made regular visits to the restaurant to be with her lover. It is said she was killed by her enraged husband when he found out about the affair. She has been dubbed “The Blue Lady” because of her attire and now roams around in a torn and bloody blue dress, although recent sightings have her in clean black cocktail dresses. According to Loyd Auerbach, she has revealed her real name as Elizabeth Claire Donovan, but prefers to be called Cayte (and specifically spelled this way). Besides showing herself, physical events such as swinging lamps, moving glassware, anomalous magnetic fields, and fluctuating temperatures have been observed during investigations. Employees also bear witness to strange events such as books flying off of shelves by themselves and the feeling of a presence. Legend: The Banta Inn has a storied history. Originally built as a saloon and inn by reputed outlaw Frank Gallegos, it later served as a bordello. The building was destroyed in 1937 by fire, but was rebuilt using some of the original timber. According to reports, two people died in the fire, and they may play a part in the mysterious goings-on in the Inn today, like objects flying around and the appearance of shadow people. 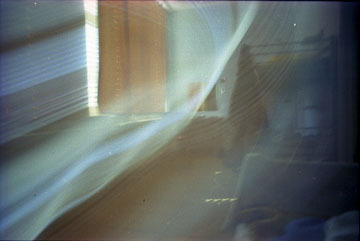 The most persistant ghost, though, is that of Tony Gurkan. Tony was the husband of Jenny, Frank Gallegos’s youngest daugther, and the couple owned the bar in the 60s. In 1968, Tony suffered a heart attack behind the bar and died instantly. It was a known habit of Tony to leave the cash drawer open with neatly stacked coins. After his death, sometimes when a bartender blindly tossed coins into the drawer and slammed it shut, he would look again to see the drawer open with the coins stacked neatly. Sightings of Tony playing poker by himself in the corner — a habit he had when he was alive — have also been reported by staff and patrons. One thing that Loyd Auerbach witnessed himself — and which shows Tony must have a sense of humour — was the jukebox playing “Spirits in the Material World” by The Police. Thing is, when Loyd had a closer look at the jukebox, he saw that it wasn’t plugged in.You can read more about Tony’s antics at the Banta Inn here. 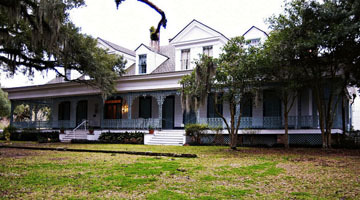 Legend: The Myrtles Plantation has long been considered one of America’s most haunted places. Built in 1794, legend has it that at least 10 murders occurred there. More recent investigation has found proof that only one actually did — William Winter in 1871. 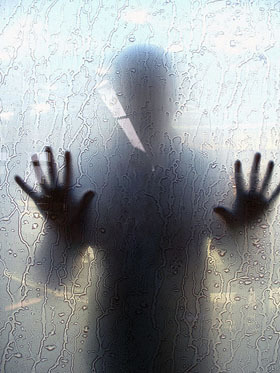 A young girl was witnessed floating in front of the games room window, cupping her hands to her eyes to peer inside. Although many of the legends that have made the property famous were ultimately found to be untrue, there is a consensus that the Myrtles Plantation is indeed haunted by restless spirits. In 1987, a ghost of an elderly lady in a green turban was seen (and later photographed), children have been seen playing in the hallways and rooms, and a young girl was witnessed floating in front of the games room window, cupping her hands to her eyes to peer inside. For a detailed history of the property and its hauntings, read this article at prairieghosts.com. Legend: Like any good haunting, the Original Springs Hotel — built around mineral hot springs which have been used to cure all sorts of maladies — has been rocked by a history of death. Suicides, accidents, and illnesses have all claimed lives and it’s thought that these spirits still wander the property. There have been reports of hearing strange whisperings, cold spots in bed, footsteps in the hallways, and presences felt to be watching. Most staff fear the second floor of the older wing after nightfall, at times hearing rumblings from locked, unused guestrooms. Perhaps the strangest of all is the “woman in white” who has been seen wandering about and walking through closed doors. 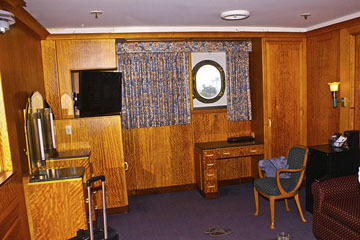 Legend: The Queen Mary — ironically nicknamed “The Grey Ghost” during its service at sea — is perma-docked these days as a hotel and is listed in the National Register of Historic Places. But between 1937 and 1967 it served as a transport ship during the war and also as a luxury liner. During its service, the ship witnessed 49 deaths on board (to various reasons). Additionally, in 1942 the Queen Mary rammed into one of its escorts as it attempted to outmaneuver enemy ships. It left over 300 people in its wake to be eaten by sharks or die drowning, as it was under orders not to stop. * John Henry, who was crushed to death trying to flee a fire. Today, knocks and bright lights have been seen near engine room 13 where he died. * A little girl who broke her neck when the ship was rocked by a big wave while she was horsing around. She can be seen around the pool looking for her mommy or doll. * The drowned victims from the crash. Sometimes strange pounding noises can be heard which are said to be them desperate to get on board. Have you ever seen an apparition? Do you even believe in ghosts? Tell us your stories below!